Does the name Oscoda, Michigan mean anything to you? For most, you’ve probably never heard of the place. For others, a familiar bell might be ringing off in the distant corners of your mind, but we’d venture to guess that if pressed for specifics, you wouldn’t know where to begin. Before we get too far ahead of ourselves, let’s circle back and start from the beginning… the true beginning. We heard that you might be interested in an Aircraft Maintenance career that offers all new hires a $4,000 sign-on bonus. 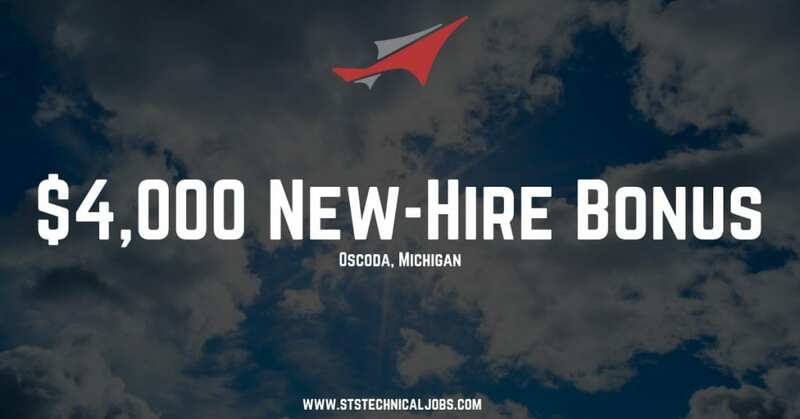 We want to tell you a little more about the opportunities we have right now in Oscoda, Michigan. Right now, STS Technical Services and Kalitta are hiring people straight from school starting at $20 / hour. All new hires will receive a $4,000 sign-on bonus. A $500 referral bonus if your referral works at least 60 days. Long-term contract and direct hire positions are available. It’s all about you and what you prefer. Overtime is offered in abundance. If you decide that you’d like to go direct, the benefits package you’ll receive is exceptional. Gain valuable experience working on 747’s and 767’s with the opportunity to obtain Gen Fam courses. A perfect landing place for veterans looking for a great career. Due to a recent expansion, Kalitta Air just created 150 new jobs, and that means there are great advancement opportunities for those hoping to move into inspection, lead, supervisor and / or foreman roles. Oscoda, Michigan offers a low-cost of living but a high-quality of life and a strong sense of community. If you love the outdoors, you’ll love Oscoda. World class hunting and fishing is in your back yard. In addition to applying online (a process that takes 60 seconds), we invite each of you to work with an STS Technical Services Recruiter directly by dialing 1-800-359-4787. Our services are always free to job seekers, and we’d love to help you land a career you love while living in a place you’ll grow to love even more. Thanks so much for your time today, and we look forward to working with you soon.